Welcome! The lobby of the Deranged L.A. Crimes theater is open. Grab a bucket of popcorn, some Milk Duds and a Coke and find a seat. 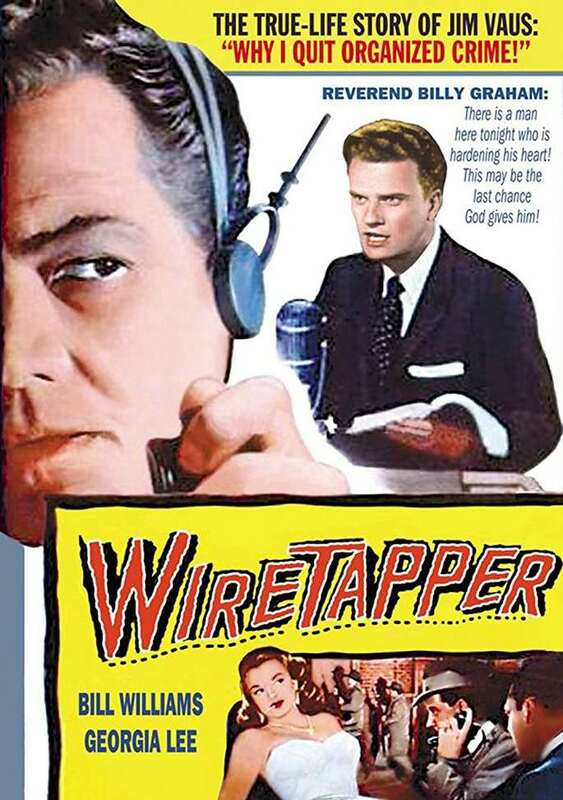 Tonight’s feature is WIRETAPPER starring Bill Williams and Georgia Lee. Mark Twain succinctly summed up my love of true crime with this wonderful quote: “Truth is stranger than fiction, but it is because fiction is obliged to stick to possibilities; truth isn’t.” This film is based on a true story with an ending that could only happen in real life. Jim Vaus was associated with Los Angeles mobster Mickey Cohen, but his life took many unexpected turns–which explains why you see Reverend Billy Graham in the poster. If you are interested in learning more about Jim Vaus you may want to read MY FATHER WAS A GANGSTER by Will Vaus — it’s available on Kindle! During World War II, Jim Vaus, an army electronics specialist, is serving a prison sentence for having stolen equipment from the army. Because Jim has arranged for released prisoners to mail letters he has written to his girl friend, Alice, Alice thinks that he is still on active duty. When the war ends, the prison chaplain informs Jim that the President has reviewed his, and others’ cases, and that he is to be released. The chaplain, aware of Jim’s letters to Alice, strongly advises him to tell her about his past. However, when Jim returns to Los Angeles, he buys a captain’s uniform and some medals, then goes to visit Alice, her mother and younger sister Helen and lies that he has just finished active service. This entry was posted in 1950s, Film Noir Friday and tagged 1955, Bill Williams, Billy Graham, Georgia Lee, Jim Vaus, Mark Twain, Mickey Cohen, Will Vaus by Deranged. Bookmark the permalink. Great movie. Loved the vintage shots of Graham preaching. So glad you enjoyed the movie — and Graham is timely.